Rereading Times – The First China Oil Painting Society Exhibition, opened on November 19 in Beijing. The exhibition was jointly organized by Beijing Council International Auction Company and Duffy Arts Center, presenting the audience 35 art works made by the Mainstay artists of oil industry, including Duan Jianwei, Shen Ling, Wang Xin Dong ,Xu Deqi and other artists in the 90s of the last century. These works will appear in the Beijing Council Autumn Auction held in early December 2013 in Beijing after the end of the exhibition. From the beginning of the new trendy art in the late 80s of the last century, Chinese painting creation appeared divided into official and unofficial camps. In the fall of 1995, the China Oil Painting Society was formally established, marking the history in which the oil painting have passed from the West to China for nearly 100 years setting off a new page, and interpreting the development of Chinese oil painting in a unique semi-official and semi- private way, showing their unique value in the intermediate zone between the system and outside-system. In 1996, nearly a year after the Society was born, it held the first China Oil Painting Society Exhibition, which is the fruit on the new cultural trees since China’s opening up, and is also a first major exhibition organized in the name of the society since the establishment of China Oil Painting Society. It is a combination of Chinese oil painting artist’s mind in several generations, and their sweat from tireless quest to create and hard work . According to the news from BBC, the oil painting painted by British pop artist Ryan (Gerald Laing) on the subject of former U.S. President John F. Kennedy’s assassination Convertible Lincoln has finally come up with art museum exhibition after lying in the warehouse for nearly 30 years. Ryan, who spent most of his life in Highland, created the painting shortly after the assassination of President John F. Kennedy 50 years ago. But Ryan’s New York brokers did not want to display the painting and put it thrown into the warehouse. The painter who devoted his life to Pop Art, was born in Newcastle in northeast of England. He has been living in Blackburn island before his death in 2011. This painting was created in 1963, and many people thought that the exhibition of this painting will lead to a huge controversy. Today, after nearly 30 years, the art museum can finally make the “frozen” works public without ideological burden. The length of The painting is nearly three meters, and it is based on the film materials made on the time when the “Kennedy assassination” shooting occurred by Dallas residents Sapp Luther (Abraham Zapruder). In this painting, for the first time, and the only time Ryan used colored dots to depict President Kennedy and his wife who were in the Lincoln sedan. In the painting, Mrs. Kennedy wears a pink hat, and her husband, President John F. Kennedy is hit back in the side. The painting depicts the American flag whicn is falling on the right side of the screen, while the legs under the car describes the secret service personnel running over on the meadow. The bottom of the painting shows the earlier screen of the film material and depicts drivers and the American flag of the convertible Lincoln. The painting is currently owned by the painter’s foundations. Ryan most famous paintings including portrait of actress Brigitte – Bardot (Brigitte Bardot) and Anna – Karina (Anna Karina). 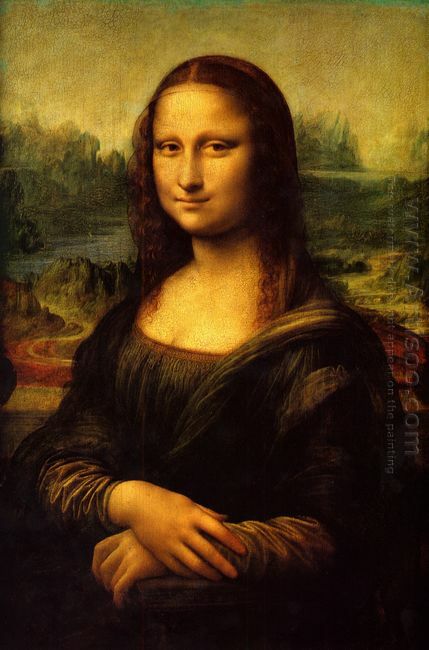 It is reported by the British Guardian, that Italian researchers said they recently discovered a lady painting by Da Vinci which was missing for as long as 500 years and pointed out that the figure owns an mysterious smile as Mona Lisa. The painting Portrait of Isabella Tim Daisy, which is completed in the 16th century, was found in the hands of a private Swiss collector, and it is identified by the authoritative experts that the painting was painted by the polymath of the Department of the Renaissance. If this work is generally acknowledged and experts agree unanimously that it was made before the Mona Lisa, the portrait painting will shake the research on one of the world’s most famous paintings. The portrait’s size is 61cm x 46.5cm, the paints and primers are the same of the da Vinci’s. It is considered as a full sketch version for Isabella Daisy. The painting, like the Mona Lisa, is in the Louvre as exhibition. 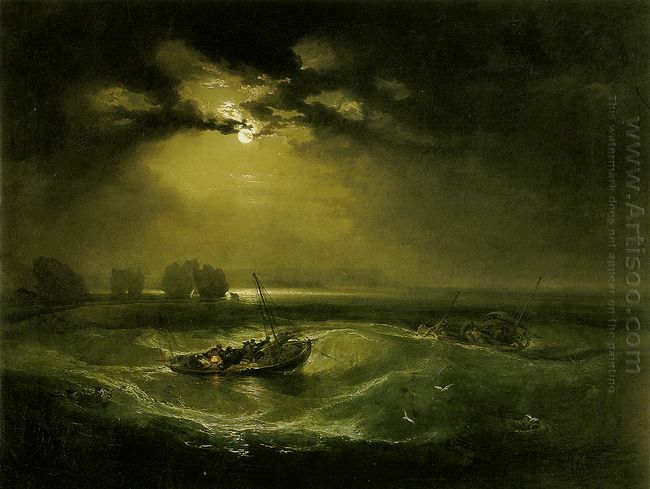 It is reported that the anonymous owner proposed a requirements for analysis on the painting. The holder began painting collection since the early 20th century, and currently has about 400 collections . Professor Emeritus of Art History, University of California Peideruiti (Carlo Pedretti) wrote to the holder that he was sure da Vinci painted the the face of the portrait, while two assistants were responsible for painting the palm fronds in the figure’s hands. In 1499, Leonardo da Vinci first met Tim Daisy in Mantua, who was a local woman Marquis. As a frequent visitor to the art industry and the leader of Italian Renaissance, the style of her dress affected women throughout Italy and France. She modeled for Leonardo da Vinci, and wrote to him to ask to make the sketch drawn into oil painting. Leonardo promised to complete the commission, and hinted that he would follow the sketch. In 1514, they may meet again in the Vatican. But historians believe that this painting was not completed, or lost forever . However, a historical clue shows that Leonardo da Vinci really completed this painting. In 1517, he showed Cardinal Luigi Dalagena a series of painting in France, whose assistant said: “There is a painting depicting Lombardy Lady”. Peideruiti said he had studied the painting for 3 years, and now this discovery will be made public. Although he still needs a few months to confirm which parts of the painting is by one of Leonardo da Vinci’s assistant. The oil painting Put Down Your Whip, by the famous painter Xu Beihong, had a turnover of HK$ 72 million in Sotheby’s auction in Hong Kong on April 7, not only significantly refreshing Xu Beihong’s painting auction record, but also hitting a new world auction record for Chinese paintings once again. At 7 p.m., located at the Hong Kong Convention and Exhibition Centre, the auction venue was full of audience. Put Down Your Whip was at a price of HK$ 2,000 million for starting, and then the price rose alternately. A telephone bidding competitors won after bidding with other bidders for about 10 minutes at the final hammer price of HK$ 64 million. Plus commissions and other expenses of HK$ 8,000,000, this anonymous collectors will pay the price of HK $ 72 million to get the painting. Put Down Your Whip is adapted from the famous playwright Tian Han, according to the German writer Goethe one-act play adapted by his novel, and is adapted into a war street play later. 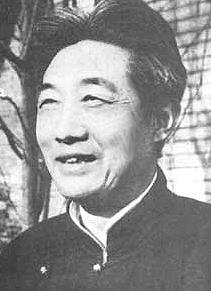 In October 1939 , Xu Beihong saw the China National Salvation Theater was giving the performances on a plaza in Singapore, deeply moved , and took about 10 days time to create a piece of anti-Japanese theme paintings. This oil painting Put Down Your Whip is 1.44 meters high , 0.9 meters wide , and Xu Beihong painted the play’s protagonist, a famous actor Anna close to the real proportion. In the painting, Anna wearing a blue and white pattern dress, holding red silk, dancing, young and old look intoxicated to watch, and there are some rags, someone in military uniform with guns, making a lifelike painting reproduction of the life of the state and heavy mood of the people during the war. This painting has repeatedly exhibited in Xu Beihong’s lifetime, but since 1954 it “disappeared”. The auction house got the painting from an Asian collector, making it reappear after hiding half a century before the world . Last November, Xu Beihong’s painting Slave and Lion was sold for HK$ 53.88 million in Hong Kong, making a world auction record for Chinese paintings at that time. 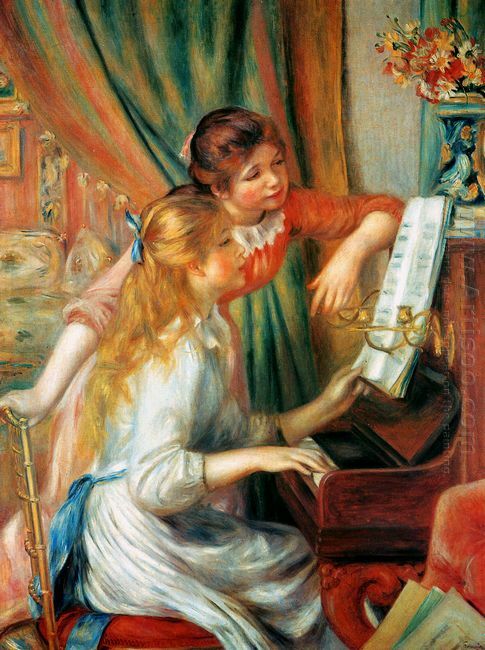 Two Young Girls at the Piano is an oil painting created by Pierre Auguste Renoir, which is a notable French artist known for his depictions of pretty children, pleasant scenes, flowers, and especially curvy women. Renoir was also the leader of the Impressionism, who first detach from the movement’s ultramodern direction. What’s more, he has a great enthusiasm for painting since he was assigned to learn skills in painting on crockery and screen in his early age. In this piece, it describes two young girls sitting at a piano and playing and practicing music in a bedroom, where there is a big, pink bed at the back. An orange and blue curtain partitioning the bed and the piano is picked up. The two girls have the same hair style that both tie a bowknot in them. Besides, they also have same style dress in different color. The girl with blond and curly hair is playing while holding the notes, sitting on a red chair with metal back. The brunette-haired girl in orange dress is standing beside and keeping an eye on the notes, which seems that they two are practicing and exchanging their ideas about how to play the song in the notes. The piano is a dark brown and there is a vase with beautiful and bright colored flowers on the top of it. There may have some other notes on a short shelf next to the piano. This scene was based on the domestic life of bourgeois at that time. And it was made for the Musee du Lexembourg museum in Paris by the French government. The Ghent Altarpiece (1425-32), a beautiful oil painting by Great Netherland Artist Flemish master Jan Van Eyck (1390-1441), is a Netherlandish Renaissance Masterpiece located in the Cathedral of St Bavo in Ghent, Belgium. 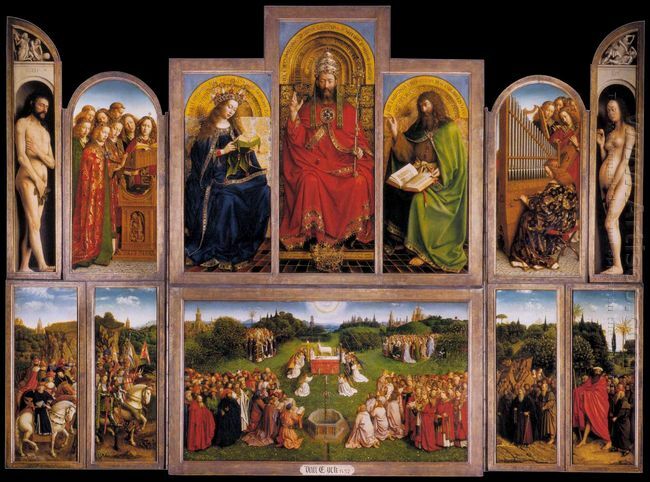 Regarded as one of the most famous paintings of any school or period, The Ghent Altarpiece has always been the core of a van Eyck’s front-page renown. Albrecht Durer, the great German master describe it as a stupendous piece of religious art and this verdict has been echoed by critics and artists for centuries. This beautiful and mystical polyptych comprises twelve panels mounted on hinges, eight of which are painted on both sides, giving two very different views depending on whether they are open or closed. It’s imbued throughout with both spiritual and intellectual signification. When opened, it portrays the communion of saints, which is “the new heaven and the new earth”, in the words of the Revelation of St John. Thus the central panel of the lower tier depicts the saints indicating the eight Beatitudes gathered around the altar where the sacrifice of the Lamb is proceeding, angels kneel, holding the emblems of His Passion. From left to right, in the foreground, are two processions facing each other. One of these is made up of the Old Testament patriarchs and prophets, and the other of figures from the New Testament. In the background are two other groups, facing one another as if they had just emerged from the surrounding jungle. A paradisiacal landscape runs through all five lower panels, uniting them in a work. In the middle of the upper tier is God Almighty, the Word, essence and origin of the universe. He is dressed in red and is crowned with a magnificent tiara. On his left is Mary and on his right, St John the Baptist. These central figures are surrounded by angels who are singing or playing instruments. At the far right and left of the composition separately are the figures of Adam and Eve. They were painted by Jan Van Eyck, and are set into trompe-l’oeil niches. Light and shadow play exquisitely over their forms which highlight as if they had been sculpted across-the-aboard. Van Eyck’s grasp of light, surfaces and variations in material, which owed to his huge patience and attention to detail, gives the work its striking technical virtuosity. The Ghent Altarpiece exemplified the new Netherlandish approach to painting, in which the decorative idealization of the Byzantine and International Gothic tradition made concession to a more realistic rendering of both people and nature, based upon observation and study. As one of the greatest examples of early Flemish painting, the Ghent Altarpiece had a great impact not just on other Flemish artists but on painters across Europe. And it’s spoken well for its brilliance of colour and wide-ranging subject matter, which contains full-length nudes, vivid portrait art, landscapes, sumptuous robes and numerous examples of still life. 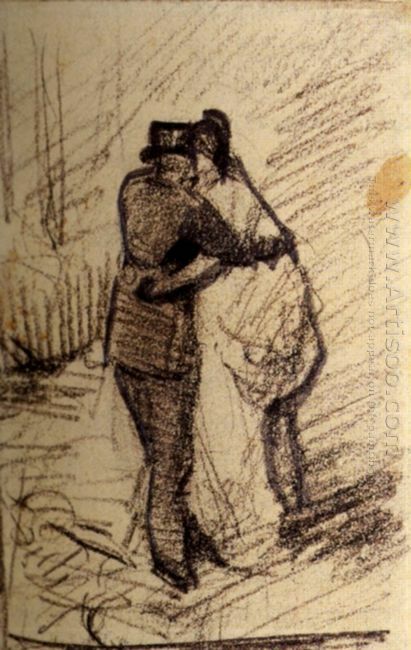 A Man and a Woman Seen from the Back 1886 is a painting made by a Dutch painter Vincent Van Gogh, who is a famous post-impressionist painter and the pioneer of Expressionism. His works deeply influenced the 20th century art. Van Gogh oil paintings like The Sunflower, Starry Night and Cafe Terrace at Night get most recognized now. In 1886, Van Gogh came to Paris and there he pursued with Impressionist and Impressionist artist. This experience broad Van Gogh’s eyesight and thus brought about his changes in his painting. He changed his painting style from dull, dark environment and colorless to bright and strong contrasting. This painting shows us in a dull atmosphere that expressed the heart and soul of Van Gogh at that time. Thus it may be painted before he did change his work. As what he himself said, he does not seek accurate painting but wants to express himself more forcefully. Maybe this painting wants to tell us that people always look forward and do not care so much about the last while looking others’ past and trying to find anything beneficial. Or perhaps he just saw harmonious while two people hug. It could be possible that when two people decide to be together, they have to accept each other’s past like leaving the whole back scenery to each other while hugging. Whatever it wants to show us, that’s what Van Gogh wants to express his feeling not just the two painting subjects. The Lacemaker is the smallest genre painting by the Dutch artist Johannes (Jan) Vermeer (1632–1675), measuring roughly 9 inches by 8 inches. 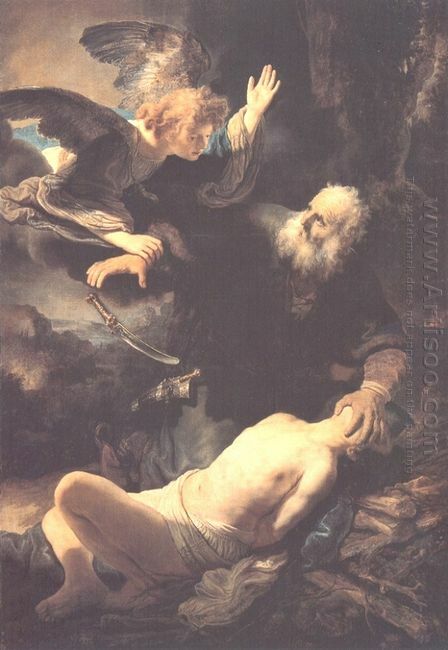 It was completed around 1669–1670, during the artist’s final years and resided in the Louvre Museum Paris. The work depicts a young lady wearing a satin yellow garment with a white lace collar, head down in concentration as she hold up a pair of bobbins in her left hand and sews the threads of a dress. The lacemaker’s hairdo was said to be in vogue for a limited number of years by the costume experts. 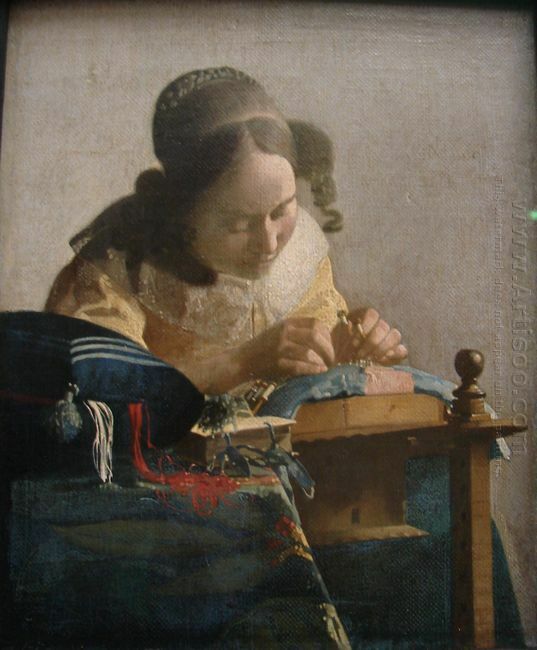 As for the lace collar, although we cannot see which kind of lace the lady is making, we can draw some conclusions from her tools which Vermeer has rendered with sufficient precision. The lady rests her hands on a flat, light-blue lacemaking pillow, which served to make shorter pieces or stripes of lace. The small parchment-covered book lying on the table is thought to be a prayer book or small Bible. Accordingly, the feather-like forms which are in front of the book are most probably book ties. It’s rendered with such artistic license that some writers regarded them as feathers. In this context, the Holy Bible definitely symbolizes domestic virtue which was a fundamental concept in Dutch civil life. The lacemaker sits at a rather complicated piece of furniture, a triangular table, for lace making. The table’s uppermost surface could be raised or lowered by inserting a peg into one of the holes in the leg. The holes can be seen in the shadowed portion of the visible leg. The young lady is set against a blank wall to minimize the external distraction from the central image, and its colour scheme is designed to draw the viewer’s attention to the canvas, and the engagement is further encouraged (with the help of a camera obscura) by the work’s blurring foreground. Vermeer’s rendition of detail, together with his delicate handling of light and shadow in order to enhance the three-dimensional contouring of the lady’s face and hands, provides us with another class of infinite art painting. Despite the small size of The Lacemaker, in many respects it is acknowledged as one of his most abstract and unusual created during the Dutch Baroque era. The great Impressionist painter Renoir regarded The Lacemaker as one of the two most beautiful pictures in the world. His fame is based on his complete mastery of abstract manner, the use of visual contrasts, spatial design, soft contouring and atmospheric color schemes, which make his work very different in tone and rather extraordinary. In addition, his success also owes to the ability to eternalize a pose rather than capture it, and more than anything a supreme talent for creating a moment of quiet intimacy.